Its for the first time after re-reading the book for the second time that i feel fit to write this one last post about the man that was Severus Snape.Many a people have asked me , how does it feel like to be right , to know that you were guessing at the truth for the past two years , without any clue , to them i say , i have moved on. I have left the fantasy world of harry potter . I started reading the book from 2001 , long before most of my friends had even heard of it , i started with the 3rd one. And ever since that , there had been a growing fondness for the one mysterious potions master, who was evil and good , misunderstood and predictable at the same time and yet trusted by the one person that mattered. Someone who was trusted by one and only one person and detested by all. 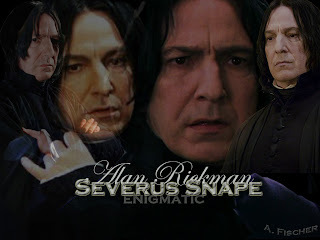 The enigmatic Alan rickman personified severus snape to its fullness. This is all i will ever write about the enigmatic Severus Snape.